1050 Mono Amplifier audio amplifier from Boulder Amplifiers, Inc.
Hi-Fi Amplifier > 1050 Mono Amplifier > Boulder Amplifiers, Inc.
Only Boulder has the rare combination of technical and creative skills required to design this visually stunning and most musical power amplifier. The output stage uses fifty-six output transistors and forty-eight power supply capacitors per chassis to assure stable, high power output into any load while maintaining detail and clarity unusual for these high power levels. The precision, elegant chassis features interlocking parts for audible dampening and mechanical rigidity. The heatsinks are machined from solid aluminum, providing both optimum heat dissipation and large instantaneous peak power without distortion. Feet use special constrained layer vibration dampening. The heritage of Boulder's nearly 20 years of experience in amplifier design is evident in every aspect of the Boulder 1050 Mono Power Amplifier. 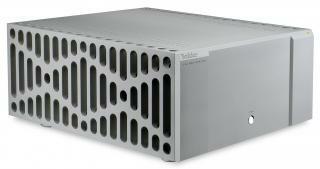 1050 Mono Amplifier > Boulder Amplifiers, Inc.